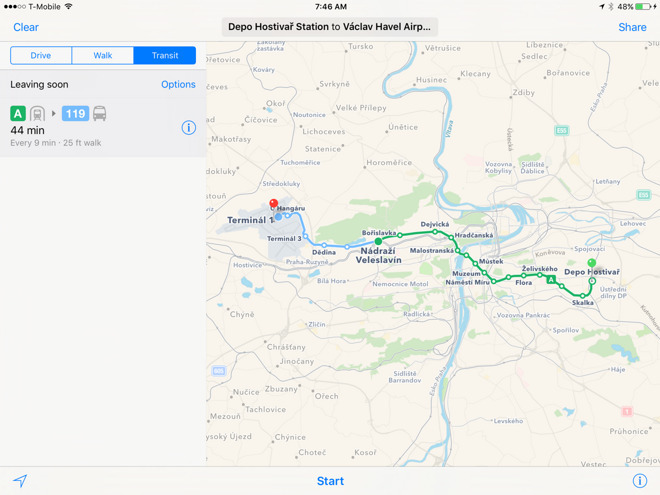 Apple is now offering Maps transit directions for the Czech capital of Prague, returning focus to the app's European users after a stretch of concentrating on the U.S.
Riders in the city can use Maps to navigate the city's various buses, railways, and tramways. Options include trips to a number of places well outside the city core, such as Kladno. To date the only other European cities with Apple transit coverage have technically been London and Berlin, though people in the U.K. can travel anywhere that has National Rail service. In fact outside of the U.S. and China, there are very few countries with Maps transit support. Some others include Australia, Canada, Mexico, and Brazil, the last only in Rio de Janeiro for the sake of the 2016 Olympics, which start this Friday. Last week, Apple also upgraded Maps with data from Parkopedia, making it easier to find information on parking lots such as hours, prices, and even open spaces and EV charging.